A group of women clad in the graceful traditional Rajasthani attire walked into Goonj’s Delhi processing center, it was a sight to behold. Their simple yet elegant disposition effortlessly attracted us. 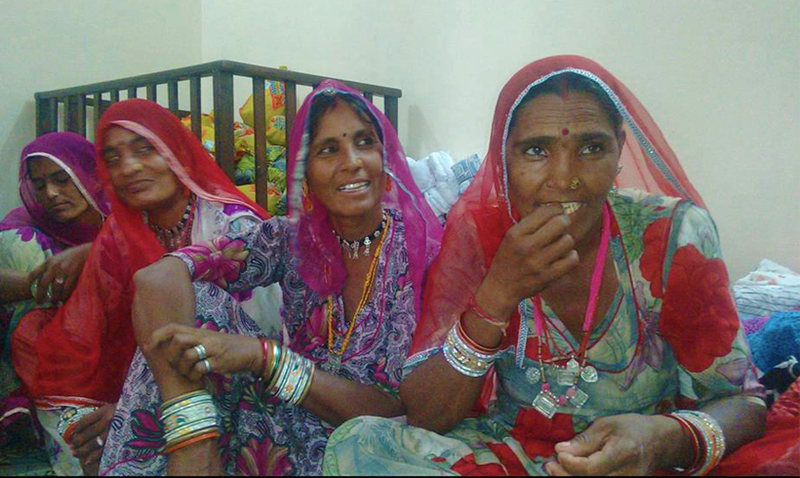 These women had travelled all the way from Barmer, Rajasthan along with Care India team to see Goonj’s work, especially our menstrual hygiene initiative NJPC, first hand. When we sat down for a heart to heart chat these women gently opened up about their lives around menstruation. Almost everyone had used the traditional cloth pad and in times of scarcity even used their old Cholis (blouses) as a pad. We realized that their challenges are the same as millions of women across rural and slum India; that of lack of awareness, access and availability of even clean cotton cloth for their basic monthly need. In absence of cotton cloth many spoke about using synthetic cloth. Many have had to travel 50-60 km to the nearest town to buy a piece of flalin fabric for Rs. 25 to be used as a pad. Some even confessed to putting sand between pieces of cloth to absorb the blood. Some shared how having no toilets adds to their woes.. Their choice is between getting up early morning or going late in the evening/ night, a daily ritual which becomes a bigger risk when they are menstruating. Talking about religious and social menstrual taboos most women in the group agreed that there is a strong belief in the community that a menstruating woman’s touch will spoil whatever/whoever she touches. For us it’s heartening even to have this kind of open conversation about menstruation. Long way to go still but it’s a step in the right direction. Goonj NJPC initiative addresses the challenge of access, affordability and awareness for millions of women around their menstruation. We strongly believe that the first step to addressing this issue is to treat it as a human issue rather than just a women’s issue. Do you agree? Understanding deeper connect between Cloth, Women and their Dignity.